Good, they want to welcome in the snake, let them live with it! Netflix apparently did not pay a penny in federal or state income taxes despite posting profits exceeding $845 million, according to a review of their tax filings. The world's primary feudal landowner is Queen Elizabeth II. She is Queen of 32 countries, head of a Commonwealth of 54 countries in which a quarter of the world's population lives, and legal owner of about 6.6 billion acres of land, one-sixth of the earth's land surface. The Queen owns all land in the UK. “We believe that these programs serve the public interest by providing quality education…"
South Korea will pay $60 million more for the upkeep of U.S. troops on its territory—this after President Donald Trump demanded that Seoul boost its contribution. The two nations inked a short-term deal on Feb. 10 increasing South Korea’s annual bill by 6.75 percent to $890 million. On the campaign trail, Trump promised American voters he would fight to secure fair deals for the United States on the world stage. America’s NATO allies have boosted military spending by $100 billion after similar demands from Trump. The South Korean Parliament has to approve the agreement before it becomes final. Unlike prior deals, which have lasted five years, the one signed on Feb. 10 expires in one year. Bargaining for 2020 funding is likely to restart in months. “It has been a very long process, but ultimately a very successful process,” South Korean Foreign Minister Kang Kyung-wha said at a meeting before another official from the foreign ministry signed the agreement. The U.S. State Department’s senior adviser for security negotiations and agreements, Timothy Betts, met Kang before signing the agreement on behalf of the United States and told her the money represented a small but important part of South Korea’s support for the alliance. “The United States government realizes that South Korea does a lot for our alliance and for peace and stability in this region,” he said. About 70 percent of South Korea’s payment funds the salaries of some 8,700 South Korean workers who provide administrative, technical, and other services for the U.S. military. Late last year, the U.S. military had warned the South Korean employees on its bases that they may be put on leave from mid-April if no agreement was reached. Seoul and Washington have held 10 rounds of talks since March, amid Trump’s calls for South Korea to pay more. South Korean officials pushed for a three-year deal keeping their annual contribution around $864 million. U.S. officials demanded as much as $1.2 billion per year. The allies worked to finalize an agreement in order to minimize the impact on South Koreans working on U.S. military bases, and focus on nuclear talks ahead of a second U.S.-North Korea summit, Seoul officials said. On Feb. 10, South Korea’s Foreign Ministry said that the United States had affirmed it would not be changing the scale of its troop presence. During his annual State of the Union Address on Feb. 5, Trump announced that he will meet with North Korean leader Kim Jong Un for a second time on Feb. 27-28 in Vietnam. The two leaders held their first unprecedented meeting in June last year in Singapore. The Singapore summit resulted in a joint agreement in which Kim committed to denuclearize his nation, pursue peace with South Korea, establish relations with the United States, and repatriate the remains of American soldiers. After the meeting, Trump suspended major joint military exercises with South Korea. Since the summit, Pyongyang has not tested any nuclear weapons or ballistic missiles. South Korean President Moon Jae-in plans to discuss the upcoming summit with Trump soon, according to a spokesman from the Blue House. The spokesman, Kim Eui-kyeom, also confirmed that officials from Pyongyang and Washington plan to meet next week in an unspecified Asian country. The Guantánamo Bay prison is shopping for a new three-cell, handicapped accessible compound — complete with a 115-foot dog run and guard house that can tap into the Pentagon’s secret internet network. Why? The White House has previously offered a three-year extension of protections for 700,000 Deferred Action for Childhood Arrivals (DACA) recipients, in exchange for the $5.7 billion Trump has been seeking for a barrier along the nation's southern border with Mexico. The offered deal would also extend protections for 300,000 recipients of the Temporary Protected Status (TPS) program – which protects immigrants from designated countries with conditions that prevent nationals from returning safely. A group advocates of President Donald Trump’s vision for increased security along the U.S. southern border joined hands in New Mexico along the U.S.-Mexico. They were physically showing their support for the construction of a border wall. One of the demonstrators cited by Reuters said the reason for the demonstrators was to call attention to the problems caused by a lack of border security. They can feel the heat and they're banding closer together and circling the wagons. This sounds like a day in Kindergarden!!! Not a grownup to be found! Communism may though. Then again??? Velcome to Omerica. Vere vee make zee populazion into low IQ conzumer units. According to author George Grant in his book Grand Illusions: The Legacy of Planned Parenthood: [Sanger] began to build the work of the American Birth Control League, and ultimately, of Planned Parenthood. Margaret relied heavily on the men, women, ideas, and resources of the Eugenics movement. Virtually all of the organization’s board members were Eugenicists. Financing for the early projects from the opening of the birth control clinics to the publishing of the revolutionary literature – came from Eugenicists. The speakers at the conferences, the authors of the literature and the providers of the services were almost without exception avid Eugenicists. And the international work of Planned Parenthood were originally housed in the offices of the Eugenics Society while the organizations themselves were institutionally intertwined for years. But, as abortion supporters who view Sanger as a heroine often do, they make the claim that Sanger is dead and therefore we are to simply ignore her Klan interactions, eugenics connections, rants about immigrants, push for forced sterilization and her failed goal of merging with the Eugenics Society. Today, we are told that Sanger was a product of her day and that her attempt to have the “unfit” sterilized, the “feebleminded” shipped off, or her radical suggestion that couples be forced to get a permit from the state to have children (she wrote: “No woman shall have the legal right to bear a child, and no man shall have the right to become a father, without a permit for parenthood“) had no lasting impact on the organization she founded, namely, Planned Parenthood. The fact is that despite the claims of their supporters, not only does Planned Parenthood have a connection to eugenics separate from their founder, but many of Planned Parenthood’s officials were members or leaders of the American Eugenics Society. The following is a very abbreviated list of examples. Let’s stop and consider the intentional blindness to truth that Joy Reid and others would have to have to claim that Planned Parenthood is not a eugenic organization. The fact is that Planned Parenthood was so supportive of the evil eugenics ideology that they advertised in eugenics journals. For Reid and others who doubt this fact, I provide some examples below (notice that their goals and beliefs go far beyond “reproductive rights”). The Eugenics Society’s honorary secretary even encouraged funding IPPF, saying, “The Society’s activities in crypto-eugenics should be pursued vigorously, and specifically that the Society should increase its monetary support of the FPA and the IPPF [International Planned Parenthood Federation]…” In summary, it is evident that from its inception, Sanger founded and nurtured Planned Parenthood in eugenics — and denying what is plain to see will never change that fact. "There were people who bred-babies for our family. No one would know about it…When I was very young, I was forced to sacrifice an infant." The Deputy Director for Intramural Research is responsible for oversight of all research that uses fetal tissue conducted by intramural scientists at the NIH, whether they are working in NIH facilities or with collaborators outside of NIH. All intramural scientists are informed of the policies and legal requirements applying to fetal tissue research. Oversight of fetal tissue research conducted by intramural investigators is summarized below. The Office of Human Subjects Research Protections (OHSRP) provides first-line advice and guidance to intramural investigators who are using or contemplate using fetal tissue. The DDIR directs that all experiments using human fetal tissue must be reviewed and approved either by OHSRP or an NIH IRB. See the Reminder for Intramural Investigators of Legal Requirements Regarding Acquisition and Use of Human Fetal Tissue for Research Purposes for additional information or the FAQs on the Policy and Procedures for Research Using Human Fetal Tissue in the IRP. If still unsure contact OHSRP directly (301-402-3444). Intramural investigators with NIH supported projects must file annual reports on their research. The text of these reports are available electronically, fully searchable and publicly accessible (http://intramural.nih.gov/search/index.taf). The Office of Intramural Research and the Scientific Directors of each Institute/Center directs investigators to specifically identify when human fetal tissue is used during the reporting period. The Scientific Directors (SD), who provide immediate oversight of intramural research in each institute, are aware of the legal requirements governing acquisition and use of fetal tissue. They are directed to ensure that all scientists who use human fetal tissue in their research assure fetal tissue is used and acquired in accordance with the legal requirements. In the annual Management Controls review, each Scientific Director will be asked to verify that he or she has reviewed the legal requirements regarding fetal tissue acquisition and use for research in their intramural program, and to identify and correct any potential problem areas. Some, we know, are cremated. Others are tossed in the trash, and discovered by pro-lifers like Dr. Monica Miller, who dutifully record their fate and give them the funeral and respect their humanity demands. But what about the other babies—the ones shipped off in containers and sealed buckets to pathology labs? When searching for the answer to that question, I found a series of horrifying testimonies on a Student Doctor Network Forum hosted by St. George’s University. On the discussion board, those who worked with the bodies of aborted babies shared their horror at what they saw. “Most of my abortion-path anecdotes come from my PSF. Here one of the residents grosses most of them in as part of some project he is doing, and we are more than happy to let him. 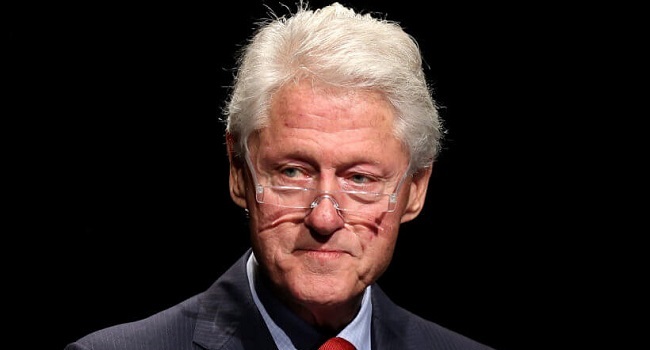 The planned visit of a former President of the United States, Bill Clinton, for Wednesday has been cancelled. Clinton was expected to witness the second signing of the Second Peace Accord. The General Abdulsalami Abubakar led National Peace Committee had said the former US President would present a keynote address at the signing ceremony that is expected to hold at the International Conference Centre, ICC, Abuja. He was also expected that to hold meetings with President Muhammadu Buhari and former Vice President Atiku Abubakar aimed at nipping threats of unrest in the bud. However, a statement by Clinton’s spokesman, Angel Ureña, regretted the former President’s visit might be politicised in a way that is not in line with the goals of the committee. By the way, did you know that the Nazi "Final Solution" can trace its birth back to Dr. Paul Popenoe's 1933 'Eugenic Sterilization' in Margret Sanger's Birth Control Review? The article was based upon the work of Mr. Gosney and Dr. Popenoe experiences with California's 'forced sterilization' laws and their implementation. Margret Sanger's eugenics friends in academia helped Ernst Rudin, Alfred Ploetz and Reich Interior Minister Wilhelm Frick with the formation of an Expert Committee on Questions of Population and Racial Policy which eventually crafted Germany's Law for the Prevention of Genetically Diseased Offspring. In the unpublished autobiography of Leon Whitney (http://www.amphilsoc.org/mole/view?docId=ead/Mss.B.W613b-ead.xml), head of the American Eugenics Society. Whitney himself documents being the "go-between" for Hitler and Sanger.